The collapse of the Venezuelan economy has been fed by a continuing drop in crude oil production. The country's annual production has gone from an estimated 2.86 million barrels per day (mmbd) in 2010 to 2.07mmbd in 2017. 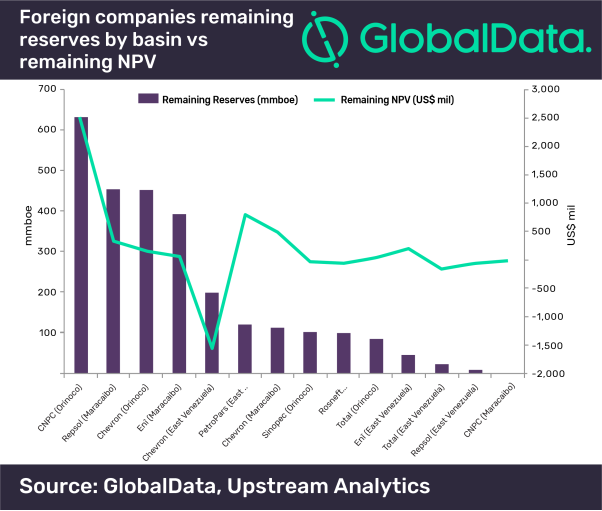 The steepest production declines have occurred in the mature fields of the Maracaibo and East Venezuela basins, according to GlobalData, a leading data and analytics company. This collapse in production has been somewhat mitigated by crude oil production growth in the Orinoco Belt, but as the central government has increasingly required more funds to manage the country's economic crisis and comply with scheduled debt payments, the capital expenditure allocated to development of Petróleos de Venezuela SA (PDVSA)'s upstream projects has dwindled. In spite of the overall underinvestment in the country's upstream sector, the Orinoco Belt has seen growth over the last decade, with only a few years having experienced declines of around 5%. The Orinoco Belt is where foreign operators have concentrated the bulk of their development activity. Most of the International Oil Companies that originally developed the Belt still maintain their operating assets. Operators like Total and Statoil recovered their initial investment in the Orinoco at the end of the 1990s. These operators have now reduced their personnel to a minimum and entered somewhat of a holding position. Repsol and ENI have also taken a step back even after having invested an estimated $2.4bn over the last five years in the offshore Perla field in the Maracaibo Basin. ENI recently de-booked the reserves of the field, and Repsol noted a clear reduction in capital expenditure for the project. There are some companies that have expanded their presence in the country recently due to specific agreements, in particular China National Petroleum Corporation (CNPC). As long as there is no tangible regime change, it is hard to conceive the Venezuelan oil and gas sector making the changes necessary to improve the trajectory of the country's industry.